Often when looking at which helicopter to start flight training in, 3 helicopters are among the most popular – Cabri G2, R44, and R22. With over 10,000 having been produced since 1979, today I wanted to take a closer look at deciding between 2 of them – the Robinson R22 & R44 – as both of these will also be available to fly at our Open Day this Saturday 23rd March. The R22 was the first of the Robinson family to come into production in the late 1970’s finally getting certified after 4 years of testing. Having currently produced around 4,500, this two seated, semi-rigid, piston engine helicopter, designed by Frank Robinson and priced for commuter/personal use took the helicopter training market by storm. 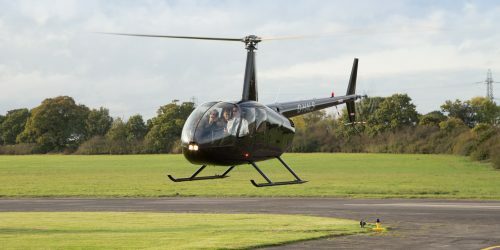 In terms of operation the Robinson R22 can reach a top speed of around 110mph, with a relatively low fuel consumption of between 8 and 10 US gallons per hour. It’s characteristic T-bar cyclic, governed throttle and cheap operating costs are now synonymous with flight training, but the R22 does have its downsides. Its two-seater compact cockpit is a squeeze for anyone over 6ft 2 and with no proper trim system installed; longer flights can be quite tiring. Its lightweight design also means the rotor RPM decays rapidly during engine failure, unless proper autorotation is entered. Robinson has however tackled safety head on with their own safety course, bringing awareness to pilots and instructors about the limitations of the R22. Today in 2019, other training aircraft have come onto the market; however this helicopter remains an extremely popular and versatile choice. If you’re looking to fly in a bit more comfort, or maybe introduce your friends and family to the thrill of flying, the big brother of the Robinson fleet, the R44, is possibly the better choice. First produced in 1993, this is a very different helicopter to the R22. Although still featuring that distinctive T-bar cyclic, its interior is more spaciously designed with 4 seats; it can take much heavier passengers and is easier to handle than the R22. With a top speed of just under 150mph, and a greater range, this helicopter is often a perfect choice for people looking to carry up to 3 passengers. Drawbacks of the R44 are its higher operating costs, increased fuel consumption of around 10 to 16 gallons per hour and a bigger frame. 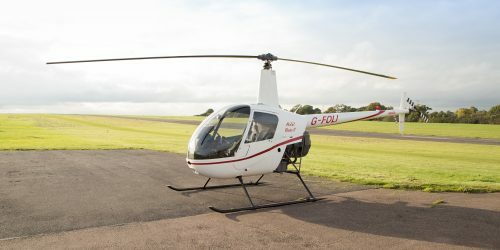 However, that doesn’t seem to affect its popularity, Robinson has produced around 6000 of these helicopters and along with the R22, it is one of the most recognisable and popular general aviation aircraft. If you are looking to start training and can’t decide between the two models, it’s quite straight forward to transition between them as they contain many of the same design features. If you already have your licence, the requirements state you will need to undertake 5 hours on a type rating course and pass a test; if you’re still working towards your PPL(H), 35 hours of the minimum 45 hours required must be on the helicopter you take your test in.